Deepawali is just hours away and the festivity have already begun nationwide. Special occasion deserve special authentic delicacies, which were loved by people in early days and still loved by modern people. 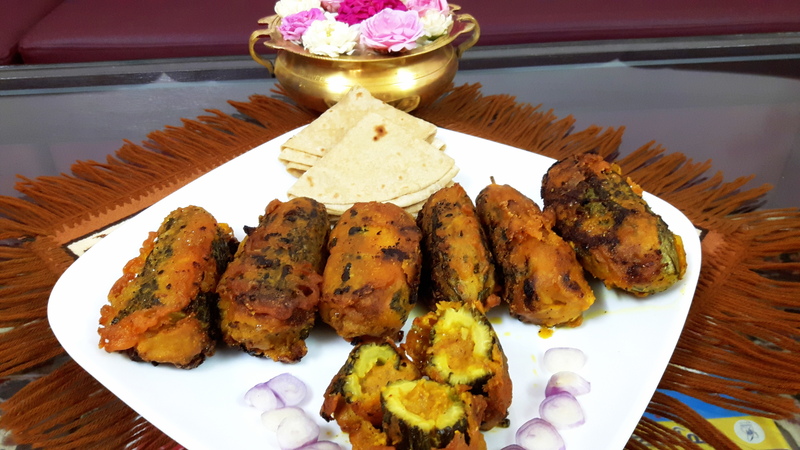 So, let’s rejoice with homemade Khoa Gujhia, the crisp and golden fried all purpose flour casing, and stuffing with Khoa along with dry fruits. Take a non stick fry pan. Pour 1 table spoon of ghee. 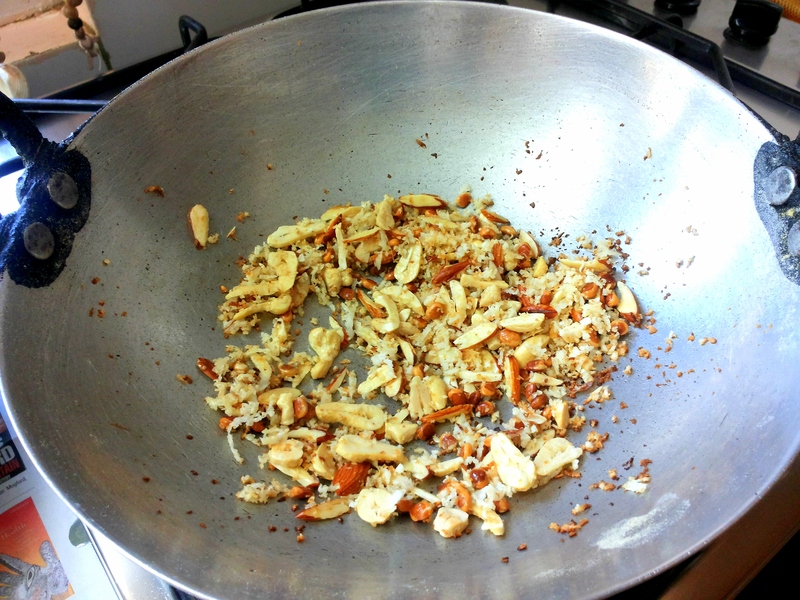 Add dry fruits, fry for couple of minutes. Add Khoa and fry on medium flame. Stir continuously till it becomes light brown in color. Add cardamom powder, kismis and coconut powder. Keep aside, allow it to cool to room temperature, add sugar powder and mix properly. Take a wide vessel; put Maida, ghee. Mix well by rubbing between palms. Add milk in small quantity and knead them, if required put some more milk. Cover and Keep aside, to be used after 20-30 minutes. 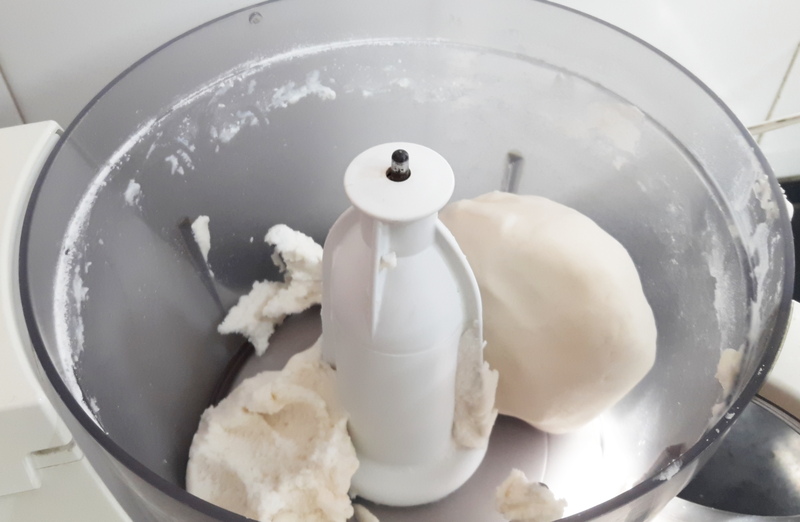 Take dough; make small balls (~ 0.5 inch dia). Roll the balls in 3 inch diameter circle like small poori. Take one poori, Place 1 full teaspoon stuffing in the half part of the poori. 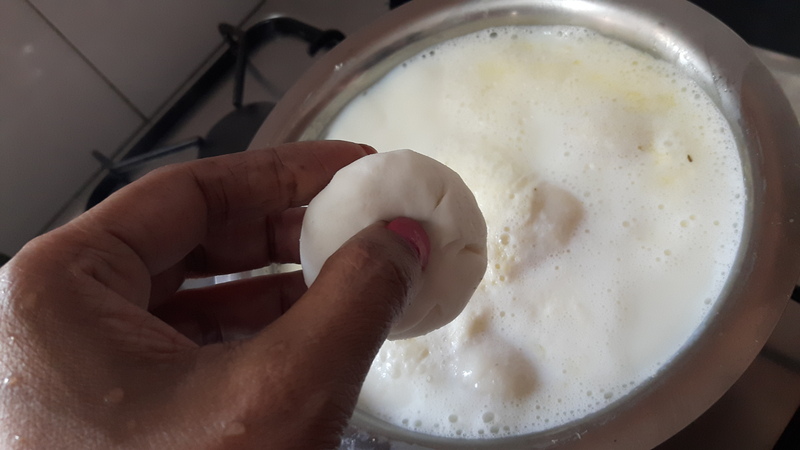 Apply wet finger around the edge of the poori. 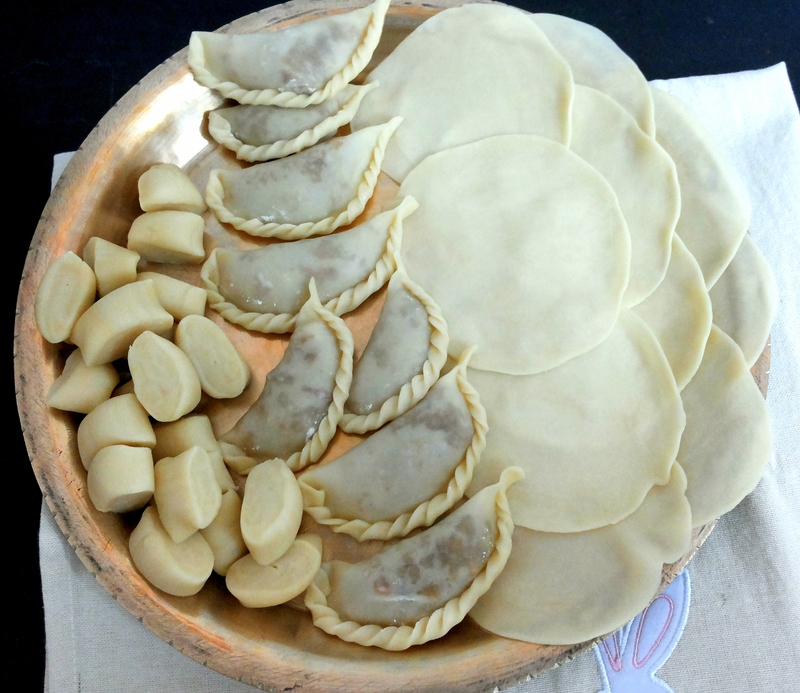 Fold it seal the round (half circle) by Pressing the edge of the poori. So that edges stick properly. Fold and twist the edges with finger. Be careful fillings should not come out. Now, the raw gujhiya is ready to fry. 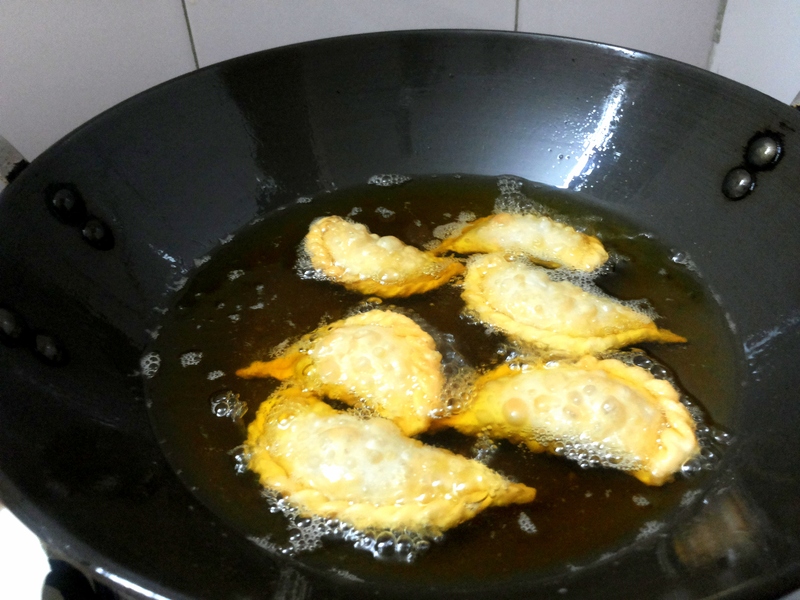 Heat ghee in a fry pan on medium heat (to check if oil is ready, put a little piece of dough in the oil it comes up slowly). Deep fry it on medium to low heat. Note: if it is fried on high heat, it will be soft. It will not be crunchy. After it starts to puff slowly turn over. 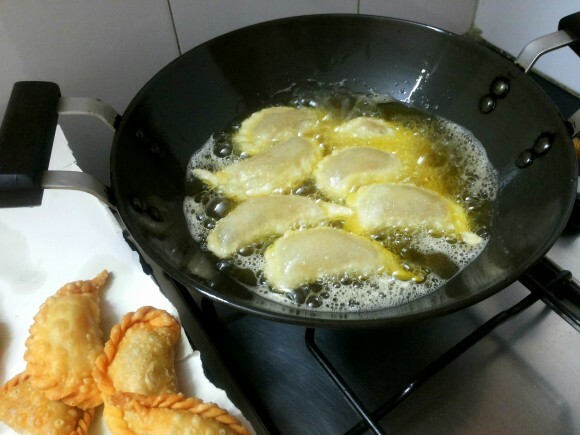 Fry till it becomes golden brown from both sides. Take it out on strainer, and allow cooling. 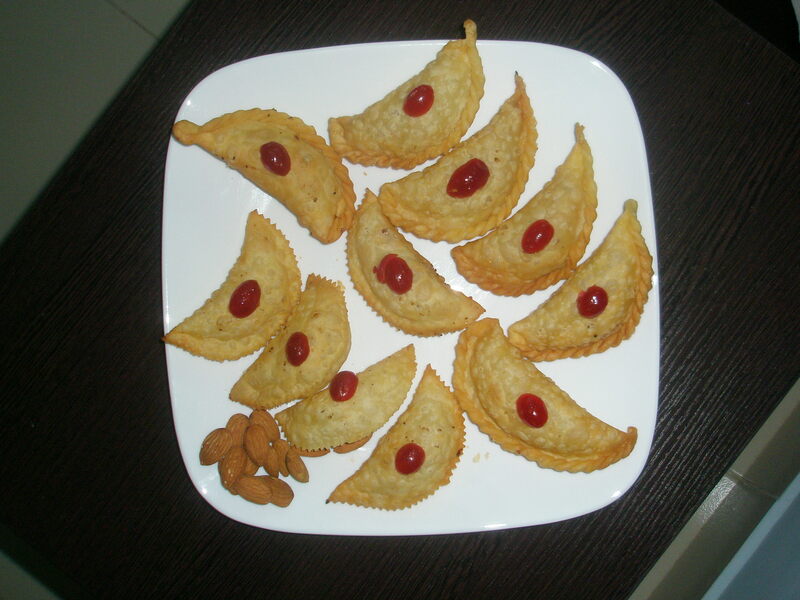 Delicious gujhiya is ready to eat. 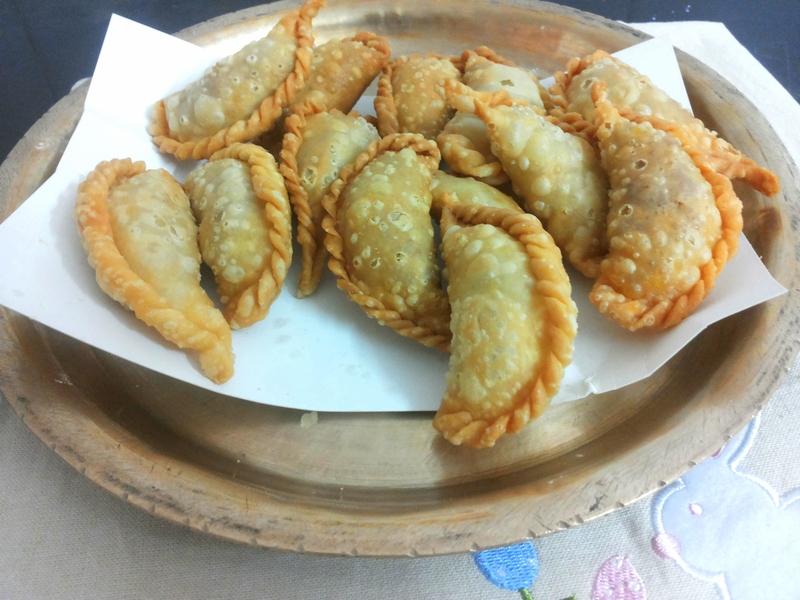 It is one of the popular traditional dishes from north India. It is usually prepared in different festive occasion .i.e. 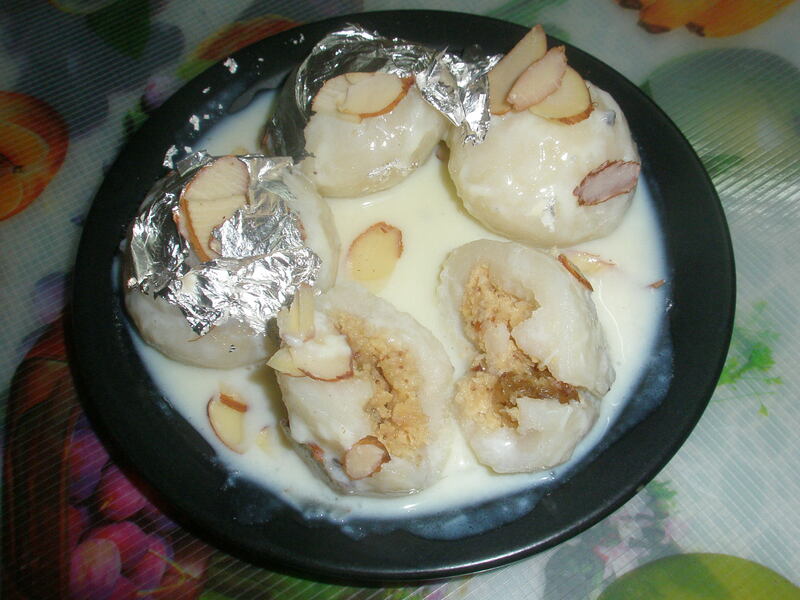 Hartalika teez, Holi Dipawali. Dry red chilly: 4 no. 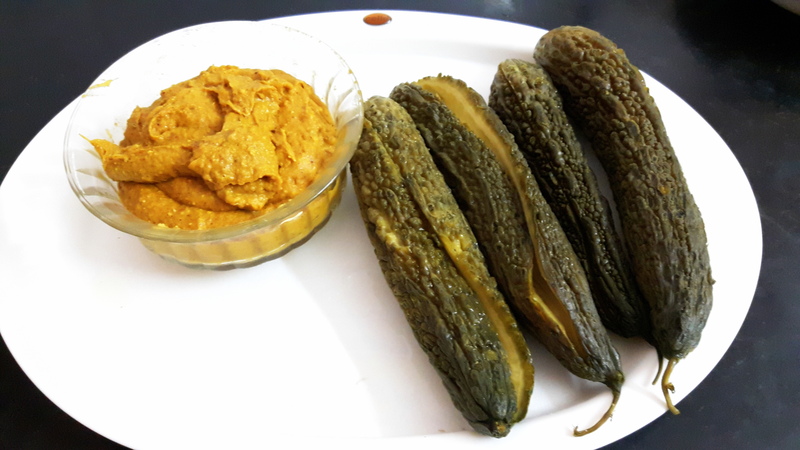 Trim the both ends of karela. And carefully make slit on one side. That is longitudinally. 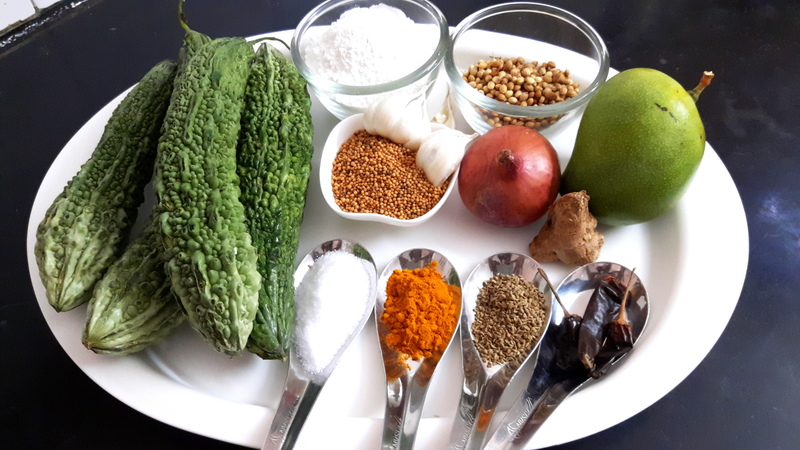 Take out all seeds of karela. Keep aside. Slice onion, raw mango, ginger and garlic roughly. Put mustard seed, ajawine, red chili, and pinch of salt and grind them together. Add coriander and grind to fine powder. Then add cut onion, mango, ginger, garlic and water, grind to make fine paste. 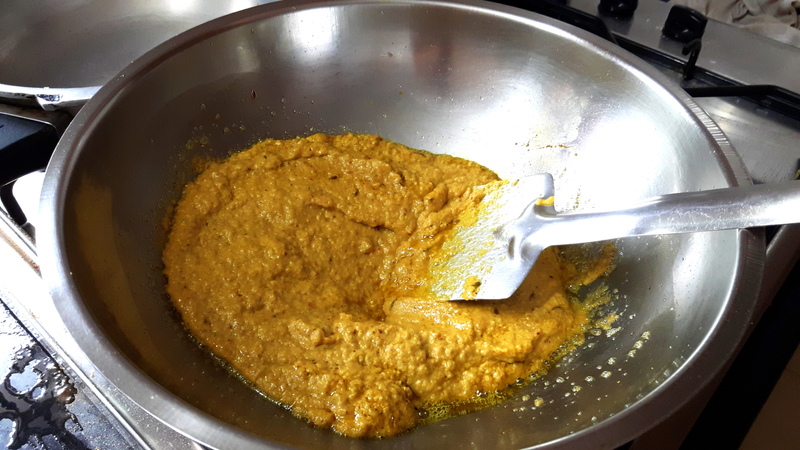 Wet Masala paste is ready. 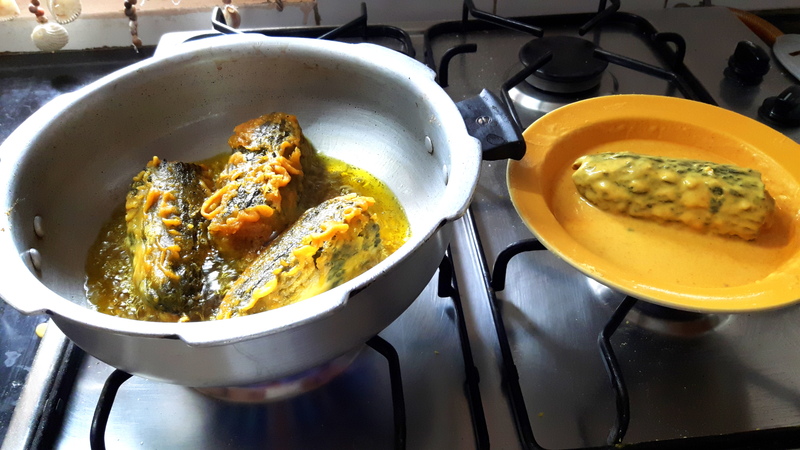 Boil the karela. Keep aside. Take a non stick fry pan. Put 4 tablespoon of oil, when smoke starts coming, lower the flame, add pinch of turmeric powder and add wet masala. Increase the flame. 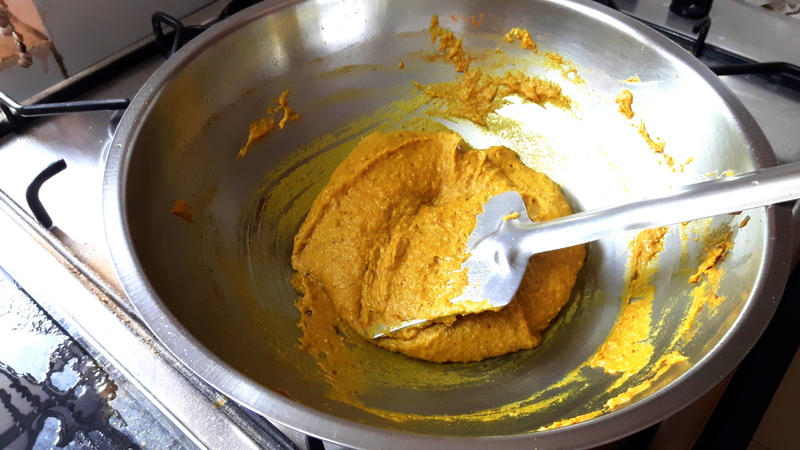 Fry this masala till it become thick , add salt and turmeric powder, Stir continuously, it should not stick into the bottom. Fry about 4-5 minutes. Now stuffing is ready keep aside. 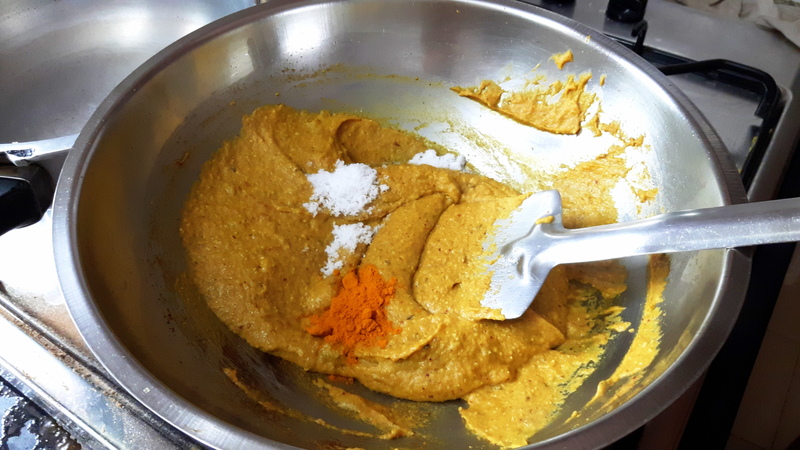 Take big mixing bowl put rice flour, 1 teaspoon salt, 1 teaspoon turmeric powder and half teaspoon chili powder. Make thick batter with the help of water. Keep aside. 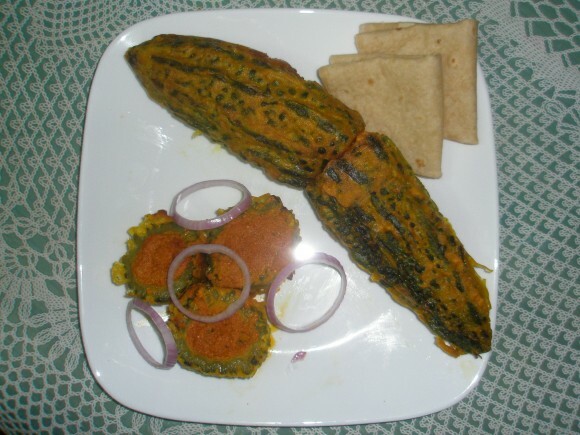 Take boil karela and stuff full with stuffing. 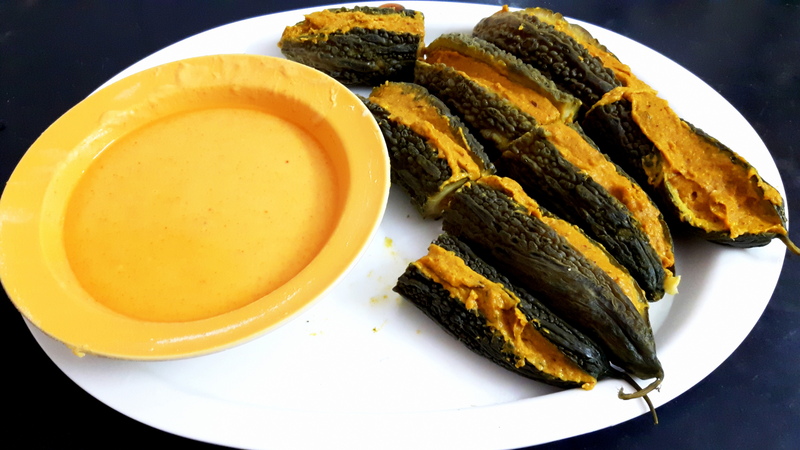 Dip this karela into batter all around properly. Take fry pan; put oil in it, when smoke starts coming, put karela dipped in batter into it. 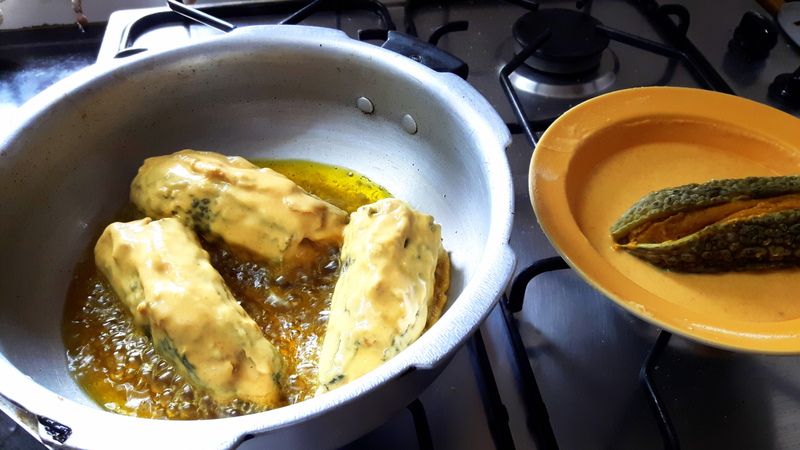 Deep fry the karela, when light brown color comes, take it out. Repeat this with all karela. 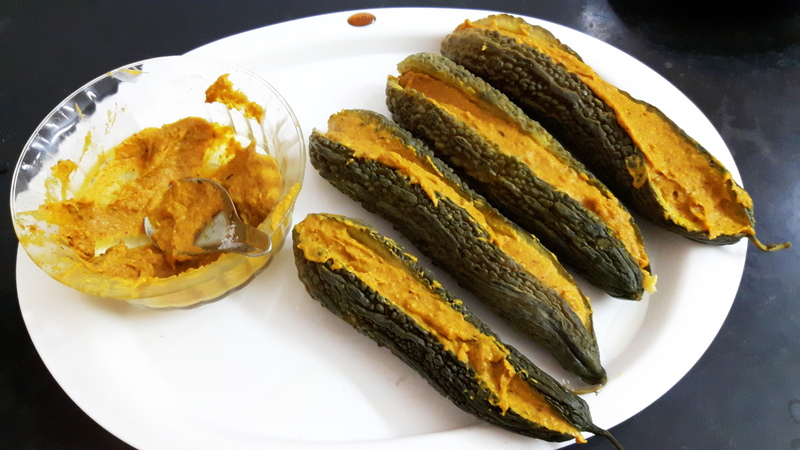 Now traditional bharwa (stuffing) karela is ready. 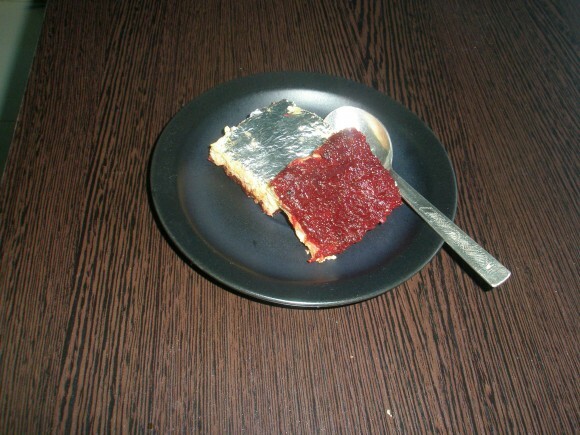 cut it into small pieces with knife. And serve as side dish. Green cardamom powder: one teaspoon. Grate the carrots and beetroot with the help of grater/food processor. 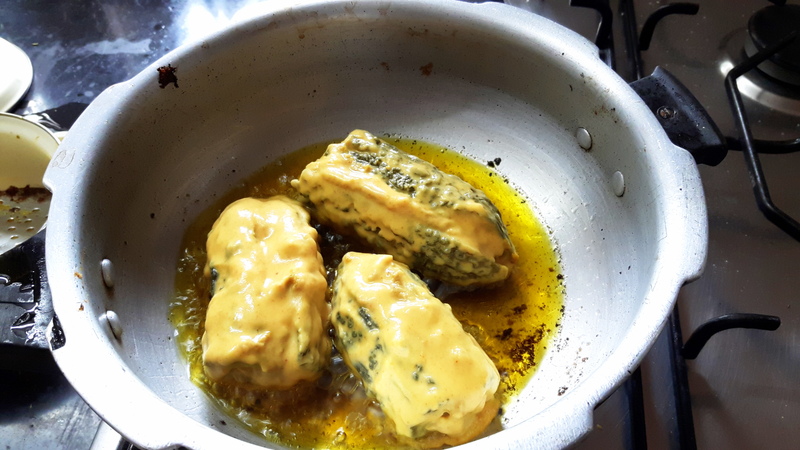 Heat 2 teaspoon of ghee in a pan. Put 2 crushed cardamom in the ghee. Add grated carrot and beetroot cover the lid. Keep stirring every 5 minutes (about 15-20 minutes on medium flame). When carrot and beet root is done. Add sugar; cook about 5-7 minutes. And add two teaspoon ghee. Fry till carrots and beetroot will take halwa consistency. Prepare plate by greasing with ghee. 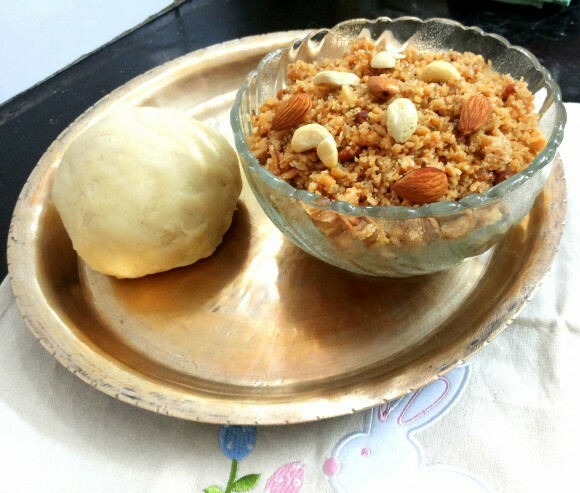 Pour halwa in that plate and level this with help of flat base of bowl. Now take another non stick pan. Put 1 teaspoon of ghee in it. 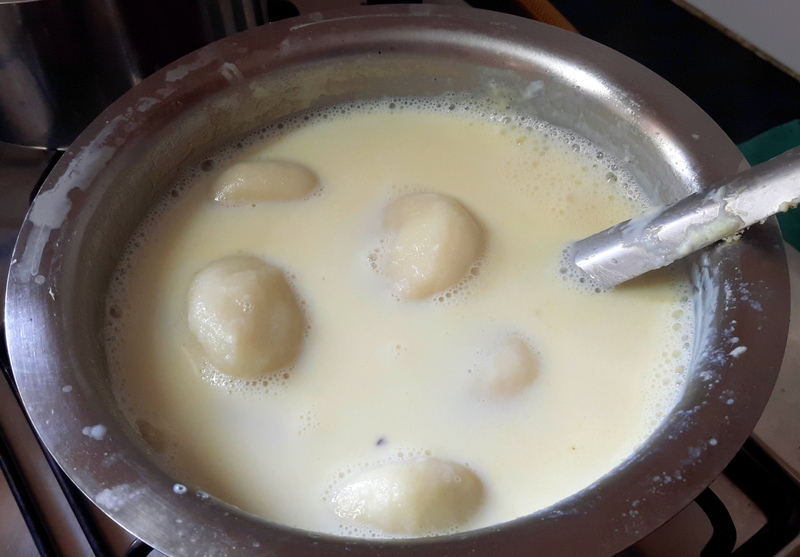 Heat the ghee put Khoa and 2 tablespoon of sugar and stir continuously. 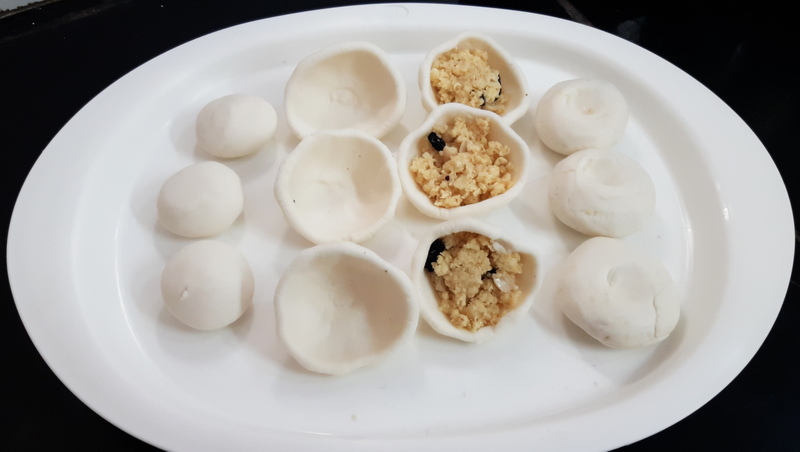 When it becomes thick and halwa comes to normal temperature, pour Khoa on this. Garnish with Chandi ka verak all over it. let it cool.after half an hour cut it into square shape. 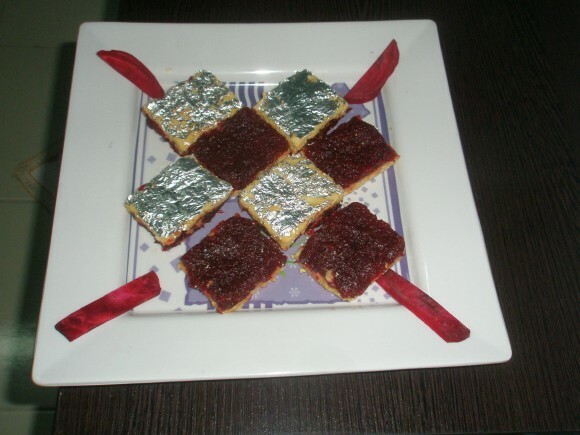 Very nutritious and Delicious halwa ready to serve. 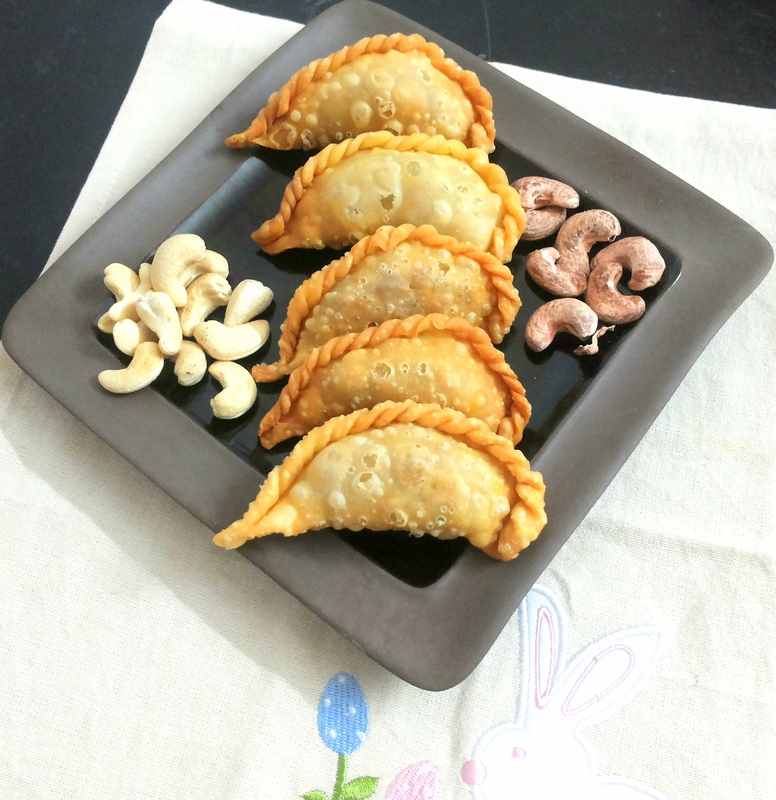 Cashew nut: 8- 10 no. Cut palak into very small pieces. 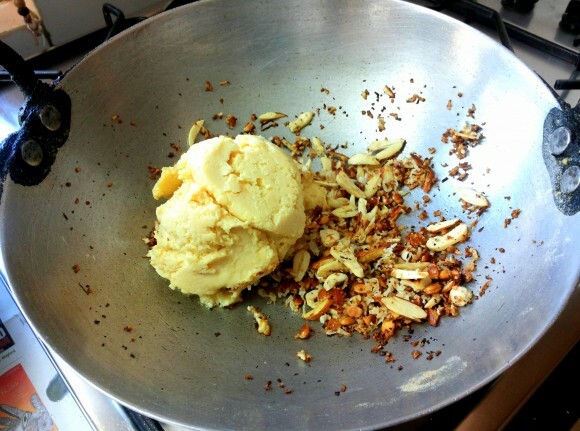 Cut cashew nut and walnut too. 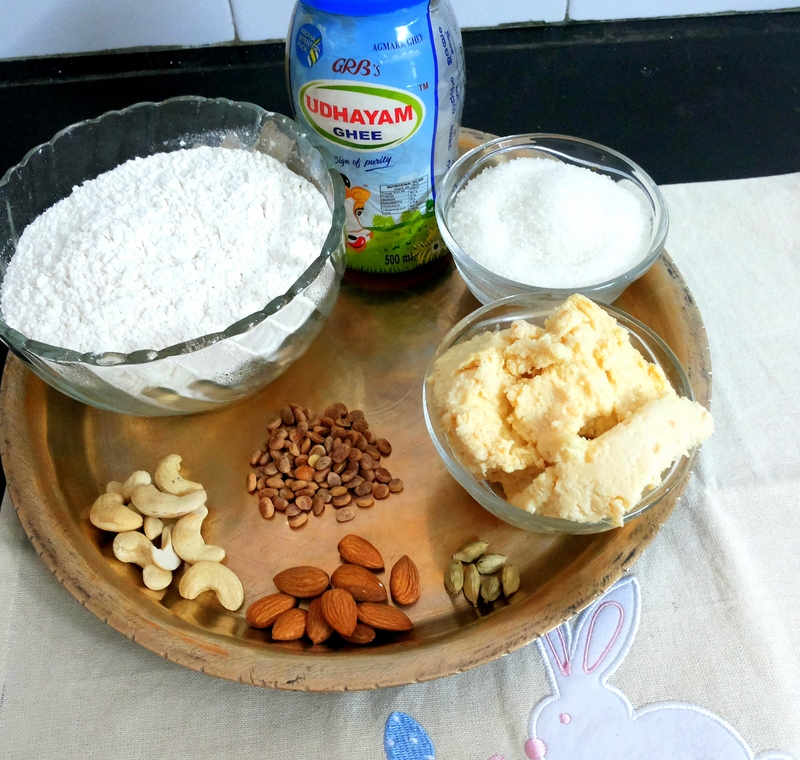 Put the curd, salt, cumin seed powder and sugar into the bowl. 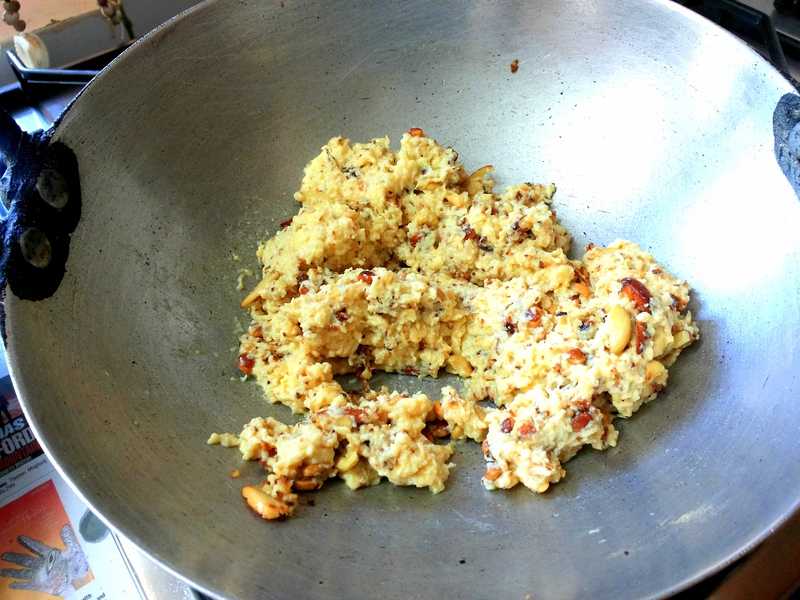 Add palak, cashew nut, walnut and dry grapes. Mix well and put into serving bowl. 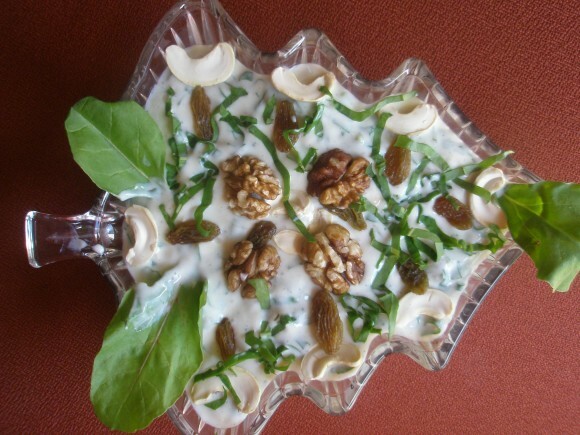 Now palak raita is ready. This is the complete breakfast in the morning. 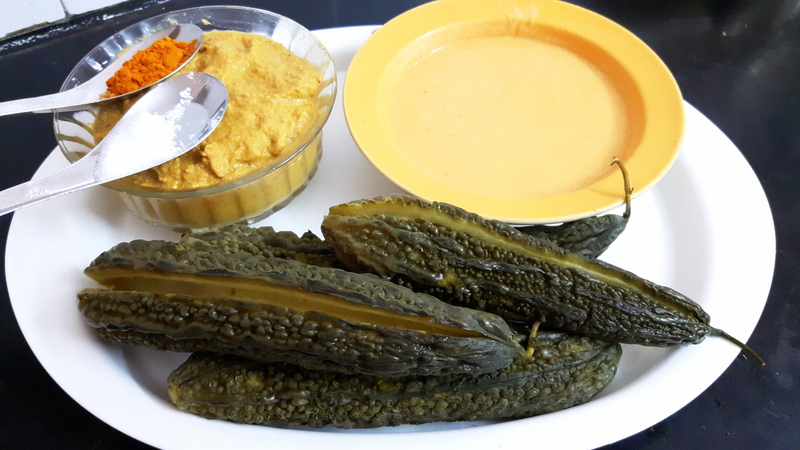 You can serve this as side dish too. Take a big mixing bowl. 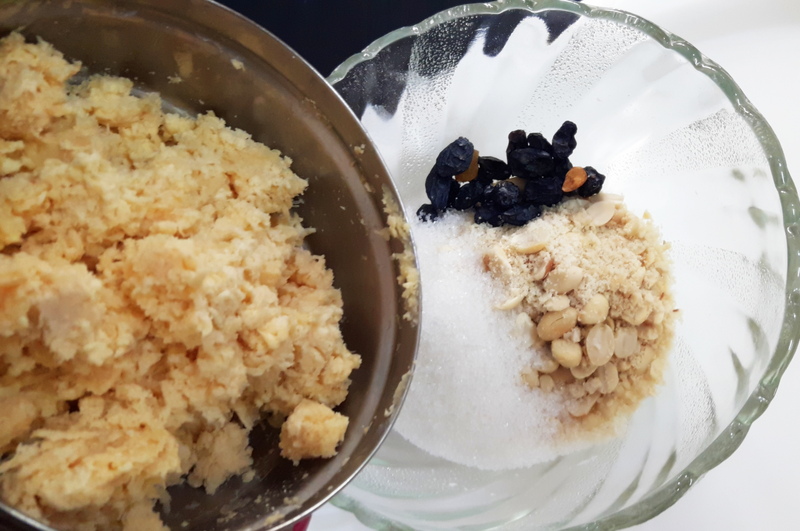 Put Khoa, sugar, groundnut powder and dry grapes, mix well. Now stuffing is ready. Keep aside. Take a big ball. 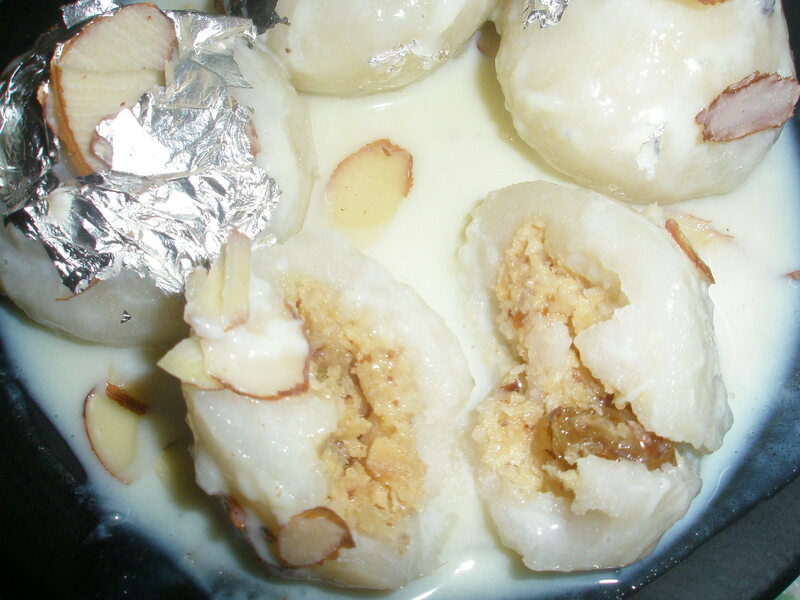 Put rice flour and sugar in this. 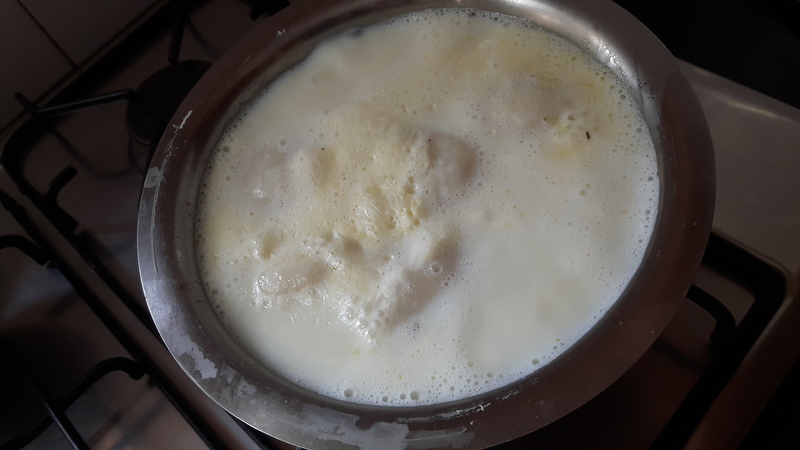 Boil one and half liter milk in a big pot. Take 1 cup of boiled milk, knead the rice flour and make dough similar to chapatti. You can knead this into the food processor. That will be easy; kneading with hot milk is difficult. 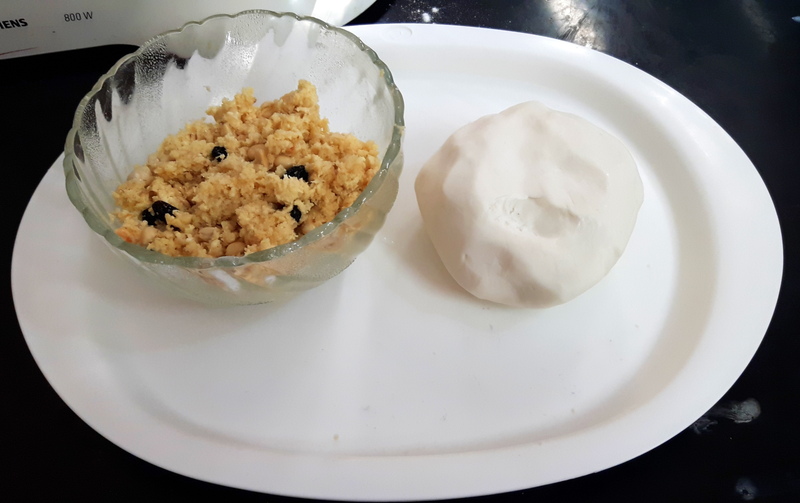 Make the lemon size ball with dough. 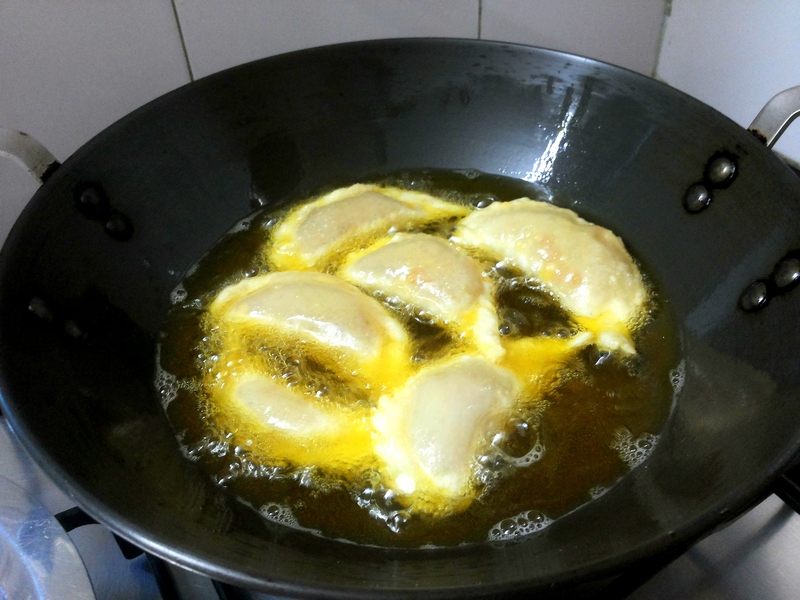 Grease your palm with ghee and make a smooth bowl shape, fill 2 spoon full of fillings in the dumpling bowl. Fold carefully and close it. Your raw pittha is ready. Boil the milk, and in it, depending on your pot size. 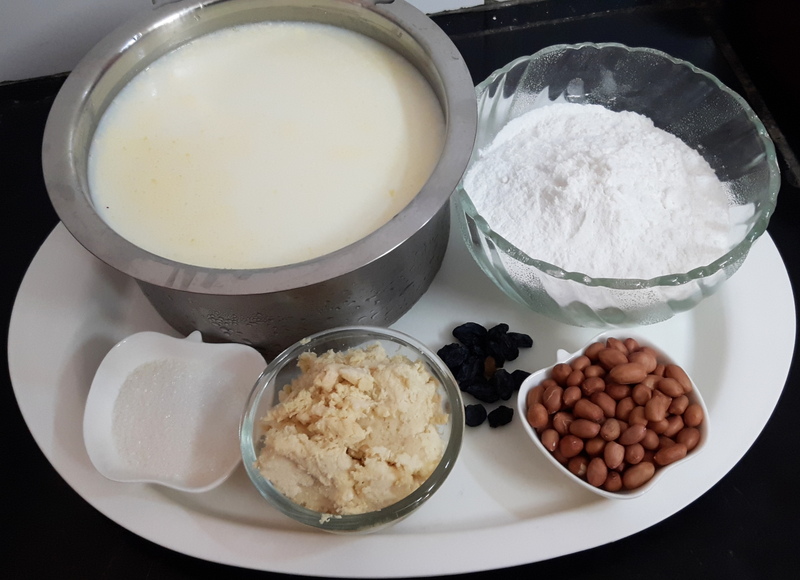 Pittha will come up after few minutes add more pittha , keep it to boil for another few minutes till it become slightly hard. Check this with spoon or fork. 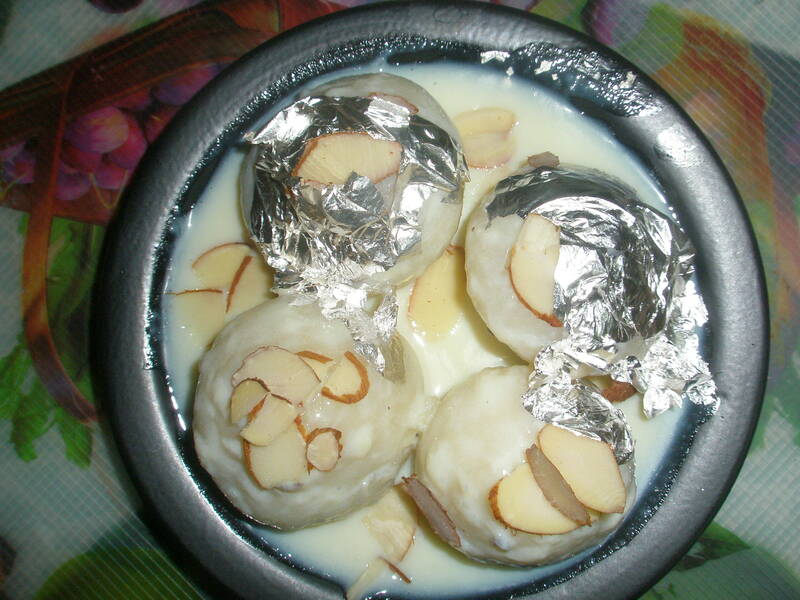 Now milk becomes thick like rasmalai. Put off the flame. Add green cardamom powder and saffron in it. Garnish with Chandi ka verk. 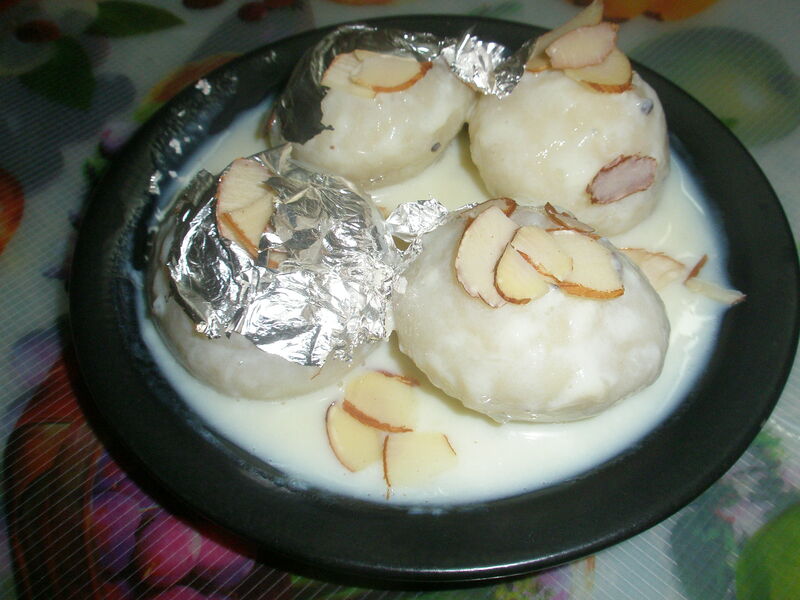 sweet royal Khoa pittha is ready to serve.